Specifications: Power: 60w voltage: Dc12v material: Aluminum lumens: 4200 lm/kit (high beam) & 1800lm/kit (low beam) simple installation - plug & play & led can bus & h4/h13 adapter - usually in 20 minutes or less newest fantastic design led headlight with halo angel eyes drl replaces original halogen and hid headlight, maintenance free, water-proof ip65 application 07-'16 jeep wrangler unlimited jk 4 door 07-'16 jeep wrangler jk 2 door 04-'06 jeep wrangler lj unlimited 97-06 jeep wrangler tj 81-'85 jeep cj-8 scrambler 76-'86 jeep cj-7 92-'01 am general hummer 03-'09 hummer h1 & h2 ¨h2 hummer needs 9007 to h4 adapter plug & play, led ballast, led can bus & h4/h13 adapter included low power consumption, life span: 30000hrs. Low voltage protection, high precision constant current driver chip. Halo angel eyes daytime running light built in internal fan and integrated cooling system. 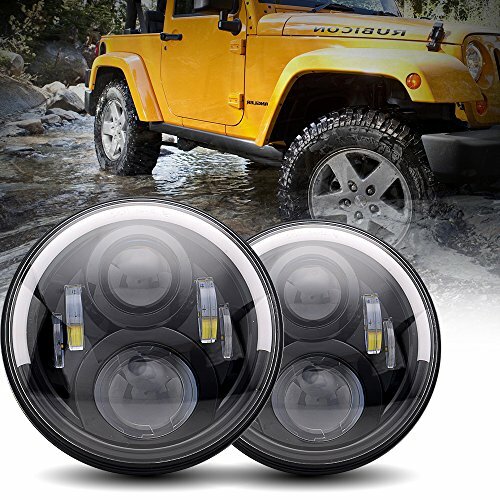 Package included: 2pcs 7 inch led headlight with white halo + 2pcs h4 to h13 adapters notification: 1.Do not touch the light and base immediately after driving. It maybe cause burn. 2.It's usual the headlight might have mist of the first time to use. For sure, it always disappear in one hour and keeps clean forever. There are two loosen wire from the headlight plug,the RED wire should be spliced to your DRL(Don't wire it to your low beam) and the GREEN wire should be spliced to your turn signal wire of your turn signal lights.Easy to install:Plug and play,including H4 Canbus & H4/H13 Adapter Conversion Adapter& 9005 9006 Fog light Adapter - Usually in 20 minutes or less. Universal 7" round led headlight bulb With DOT APPROVED replaces original halogen and hid headlight. Fitment:Jeep Wrangler unlimited Sahara JKU,Jeep JKU,Jeep Wrangler Unlimited rubicon Sport,Cruiser FJ JK TJ LJ CJ5,MGB,Jeep Wrangler Rubicon Unlimited,Jeep Wrangler Cradle,truck,VW Westfailia,Miata,Hummer H2. Worry-Free Warranty: Includes a free 1 year warranty and lifetime support.Package included:2pcs 7 in round angel eye halo led hedlight,H4 Anti Flicker Decoder,H4-H13 Conversion Adaptor. If you have any questions about this product by TURBOSII, contact us by completing and submitting the form below. If you are looking for a specif part number, please include it with your message.